Fresh air, pretty dresses and giggles - just a few of the things that uplift me and brighten my day. It's the little things that count. As I've got older, I've learnt that. I think it's so important to see every day as an opportunity and see the good in each day. It's much easier said than done, often I find myself getting overly stressed, tetchy or upset and the rational me says 'come on Em, life is for loving and embracing, some people would do anything to be here, living and breathing' but there's often that over-emotional part of me that gets worked up, overwhelmed or a little too stressed out, it's so important to take time, relax and realise that life could always be so much worse. So, when Starbucks asked me to to talk about things that uplift me in celebration of their new Teavana range, I couldn't say no. Any opportunity to share some positivity! I headed out into London for the day with Oscar - walking around London definitely uplifts me and makes me feel constantly inspired. But, first things first, I grabbed one of the new Teavana's to see what the fuss is all about. 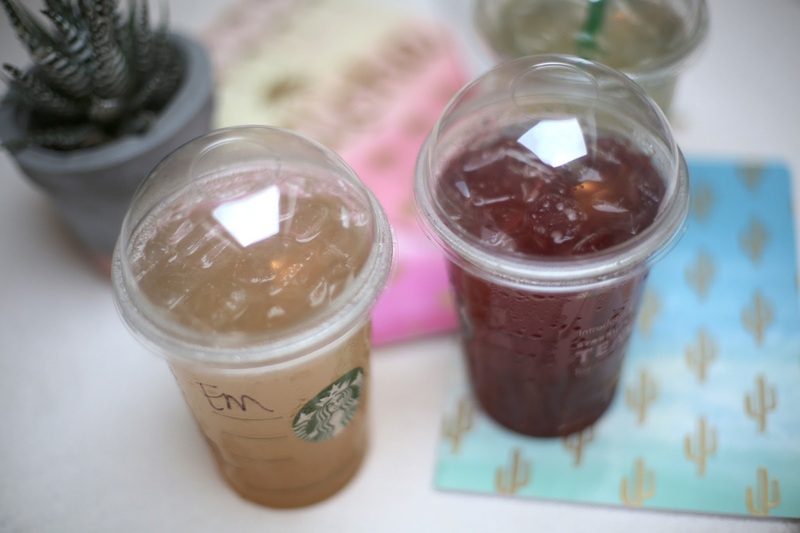 I sipped on the tea - it's a new, modern take on tea, perfect for Summer - shaken with ice, syrup, lemonade, imagine a fresh, Starbucks cocktail, that's what you get (ps, these amazing notebooks are from Claires Accessories if you're wondering - swoon). I grabbed my Chanel espadrilles ready for a day in London. Teavana is all about energy, action, vibrancy and positivity (basically everything I stand for) and it's not often that you'll see me without some tea in my hand, on hot days I still want to drink my green tea but I don't like drinking hot drinks when it's warm outside so this is perfect as the ice makes it super refreshing. I'm pretty excited to be doing a rooftop sunrise yoga class with Starbucks later this week (Friday, please hurry!) to enhance those positive vibes a little bit more and hopefully, sample some more Teavana! More on that on Friday! Now, let's talk about a few things that uplift me. Pretty Dresses - There's something about twirling around in a pretty, floaty, girlie dress that makes me so happy. I'm not sure if it relives my childhood when I was a bridesmaid or just makes me feel super girlie but I feel like a little fairy, I feel so girlie and it takes me back to a moment of carefreeness, happiness and my childhood I guess. This particular dress can be bought online here and my new sunglasses too! Fresh Hair - Why do I always feel so uplifted when I walk out of the hairdressers? I honestly feel like a new woman every single time. I've become pretty addicted to bouncy blow dries because they make me feel so confident. I need to learn how to do my hair as well as Sassoon do it so I can get that bouncy look at home. A trip to the salon uplifts me so much. Family - The above may seem more 'materialistic' but family uplift me more than anything. Walking around on a Sunday afternoon with my grandparents, they're like parents to me. Two of my favourite people in the world, hearing their stories, learning from them and making them proud. Spending time with family really does uplift me, we're all crazy busy but even if I can just grab a quick hour with my Mum and catch up, it makes my day. Endless Giggles - Giggling until your belly hurts, whether it's with friends, family or my boyfriend. Nothing clears my mind and makes me feel uplifted better than a big old giggle. Sometimes you just have to let go and let it all out! Fresh Air - Exercise and fresh air massively uplift me. You never regret a work out, you'll know all about my health and fitness mantras if you've read my fitness section. If I'm having a bad day, I guarantee I feel a million times better once I've gone outside and got some fresh air, it's like a little miracle spray which clears my mind. When I was in China, I really noticed just how lucky we are to have such fresh air in the UK. There were times when I really forgot what fresh, good air felt like. Flowers - Flowers well and truly uplift me. They are my favourite gift of all. I love giving flowers and I love receiving them. They honestly make me so happy. Bright, beautiful and thoughtful. I love thoughtful things. Good Food - My favourite hobby is eating and drinking, I'm not even joking. Whether it's doing my work in a coffee shop and sitting with a cup of tea, going out to a bar on a weekend or finding the latest foodie hot spot on a Saturday. Nothing uplifts me better than really good food with really good company. That's my perfect kinda day. If you ever head to Leeds and love food, you can read about my favourite places to eat and drink in Leeds on my blog post. Lastly, supportive people - nothing uplifts, inspires and motivates me more than seeing women around me supporting each other. It makes me so happy. Remember what they say, a flower doesn't compete with the flower next to it, it just blooms. You can read more about my friendship ups and downs on my friendship blog post. Thanks to Starbucks for asking me to write this post, it was an honour to collaborate with one of my all-time favourite brands. Sponsored but ALWAYS my honest opinion. Please do tell me what uplifts you in the comments below, I'd love to know! Any of the same things as me?